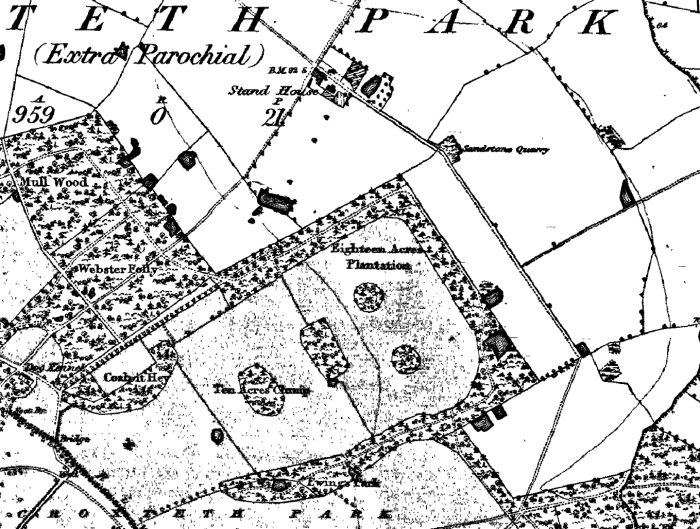 The early history of Croxteth Park sees it as part of the large hunting forest of Toxteth from the 12th Century onwards. This meant that it kept its green and rural character right up until the end of the 20th Century. Origins of the name: Possibly from the Old English, to mean Croki’s Staith or landing place. 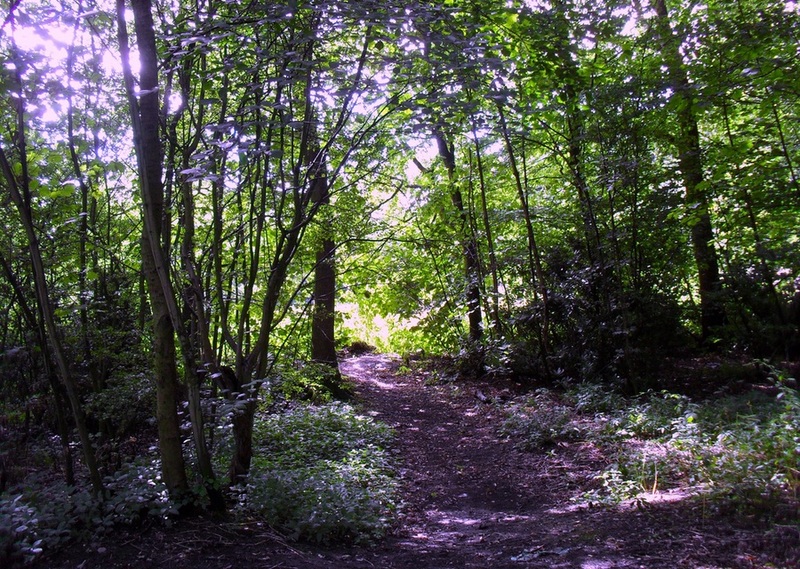 Today, Croxteth Park is best known as a green space in Liverpool’s historic suburb of West Derby. The Park itself (now a Country Park owned by Liverpool City Council) has fields, cows, horses, a Home Farm, wooded glades and footpaths. But we’re concerned with the township of Croxteth Park, which doesn’t even include Croxteth Hall (which is included in the history of West Derby). Croxteth Park township is small, and extends from the River Alt in the south west to Croxteth Brook in the north east. Just beyond the north west boundary sits Croxteth Primary School, while the south east edge sits between Deysbrook Lane and Stockbridge Village. The area has been a source of coal for centuries, with outcrops near Croxteth Hall, and a sandstone quarry is marked on the 1851 map. The area was once part of the massive hunting forest of Toxteth and Simonswood. The nearby village of West Derby (‘deorby’ suggests a deer-hunting area) is another clue to the royal hunting ground in the area. Croxteth Park remained undeveloped until the 20th Century. At that point, the neighbouring areas of Gillmoss and Knowsley became the place for new industries to develop. However, it was only in the 1980s that much building actually took place in the township itself. Even by the middle of the 19th Century the township of Croxteth Park was far from any significant settlement on this bank of the Mersey. The area was flat and marshy, with West Derby village on slightly higher ground (a sandstone ridge) to the south west. The township was therefore covered in large ponds and bordered on both sides by the two rivers, the Alt and Croxteth Brook. As well as water, the area had much of the woodland that had existed here for centuries. Names on the 1851 Ordnance Survey map include Dam Wood, Craven Wood and Little Wood. There are also areas of woodland not named, such as the trees around Croxeth Hall and other plantations. Coalpit Hey in amongst the plantations is a clearing with a name suggestive of the long lived coal outcrop. Although the area was rural, a few buildings did exist. Gilmoss (“R. Catholic”) Chapel, Gillmoss School and Gillmoss Farm clustered on the north west boundary of the township. Nearby were Croxteth Windmill, dog kennnels and a well. Maybe the biggest evidence of human habitation was Stand House, which sat across the road from the site of the modern Langley Shopping Centre. The house is marked with an orchard, a pond and some enclosed fields. It’s the only building in the township in 1851, apart from those at Gillmoss and Craven Cottage in Craven Wood. Little had changed in the 43 years between the first and second edition OS maps. Croxteth Park was still a partly wooded rural township, and only the names marked on the map point to changes in land use. The dog kennels, once plainly labelled, were now the Croxteth Kennels. The map labels Gillmoss Chapel as a Roman Catholic Church for the first time, although records of services go back as far as 1425. Three churches had already been on the site by 1900. 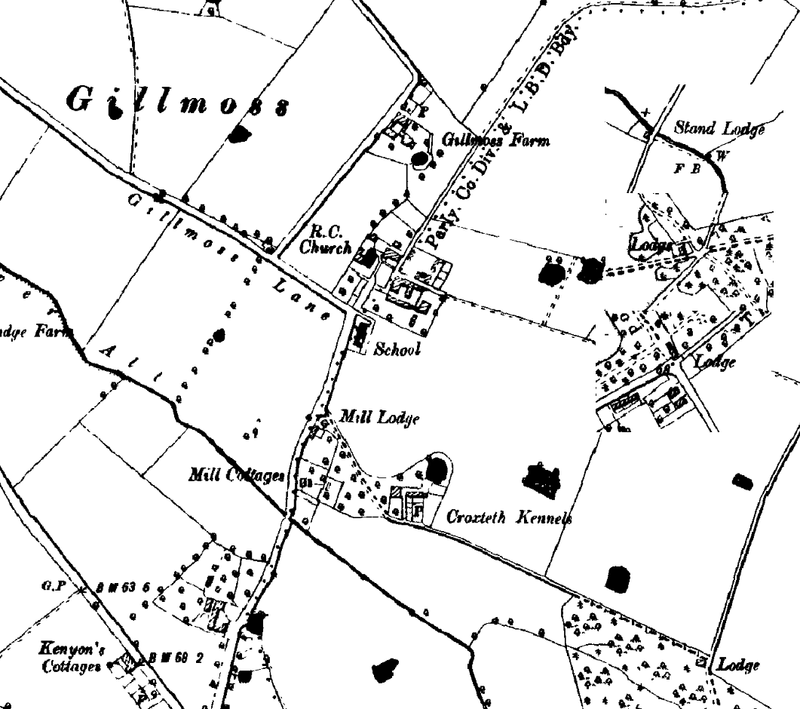 Gillmoss Cottages appear on the 1894 map next to the windmill and Mill Lodge. Mill Lodge itself sits at the corner of the lane, later Gillmoss Close and Parkstile Lane, leading to the new building simply marked ‘Lodge’ in Dam Wood. Mill Cottages and Mill Lodge still stand today, and the footpath running from the end of Gillmoss Close is on the course as the 19th century footpath. Stand House is now Stand Farm, suggesting a change of use. Also newly marked is Stand Lodge to the north east. This sits right on Croxteth Brook, and again the building still stands to the north of the Fir Tree Drive estate. There is also a new lodge in Little Wood on the south west boundary of the park and township. Perhaps these new lodges helped define the boundaries of the estate. Perhaps, with the growing city and villages nearby, more effort was needed to keep out undesirables. either way, it shows how these estates were still evolving even at the dawn of the 20th century. Gillmoss continued to grow at the beginning of the new century. The map shows new buildings at Gillmoss Farm (and two buildings are marked as being the Farm). Gillmoss Cottages are marked for the first time. The Mill Lodge has also changed its name; it is now Gillmoss Lodge. On the other side of the township are the Croxteth Kennels and a Training Ground on Deysbrook Lane. Perhaps these were both part of the increased security of the park! The Croxteth Kennels previously marked on the north side of Croxteth Park are no longer there, and were presumably replaced by those at Deysbrook. The map produced between the two World Wars shows little change. Dam Wood Lodge is the name associated with the previously anonymous Lodge in the wood of that name. Already the Kennels seen on the previous map have disappeared. A few glimpses of the coming changes are evident on the map from this period. The edge of the city is marked (the city boundary had encompassed West Derby in 1895), and the land to the north west of Gillmoss had large factories built on it. This post-war industrial expansion is dealt with in more detail in the history of Fazakerley and other outlying areas. 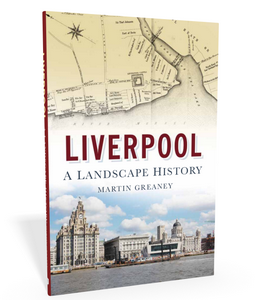 It shows just how close Liverpool had already grown to the edge of the Park. The story from the end of the Second World War onwards is one of stillness amongst the bustle of the city outskirts. 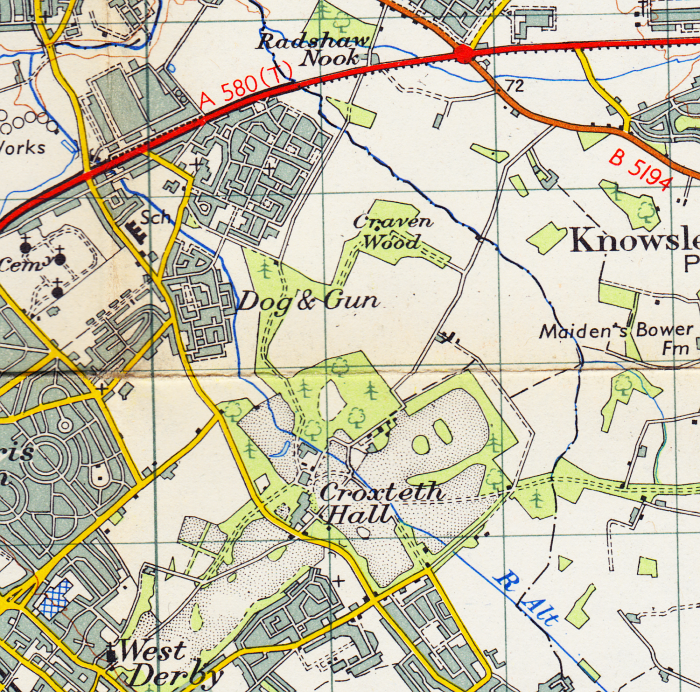 The map shows the area around the Dog and Gun pub becoming built up from the edge of the Croxteth Park township to Parkview Road in Gillmoss. Kirkby and Fazakerley are also developing as out-of-town industrial and residential areas. But the park around Croxteth Hall remained largely as it was in 1851. This state continued through to the mid-1970s. The map shows little more than the growth of areas just outside the township. 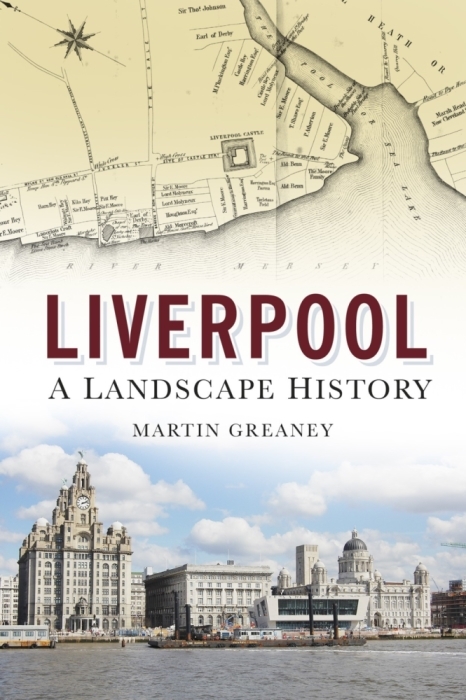 Two of the key developments in Liverpool’s history are shown on the 1978 map. The M57 and Cantril Farm, later to become known as Stockbridge Village, are shown. The motorways were springing up all over the country, and the M57 created a rapid way of getting around the edge of the urban area. Society was meant to become more mobile, and the new towns of the 1970s were built to take advantage of this. Cantril Farm and other estates in places like Speke and Fazakerley took in huge numbers of people. They had been re-homed from the terraced housing clearances in Everton and Toxteth. Another community was built in Gillmoss, and on the 1978 map this was simply marked as Croxteth. In the 1980s the first tracts of Croxteth Park were built on. Large estates of detached houses were built in Dam Wood and Craven Wood, reaching out to Croxteth Brook on the north side of the township. What’s interesting to note is that the new buildings were not built on old woodland. They were placed within and around the woodland, which maintains the shape it had in 1851. It’s the open fields which have houses built on them. The Coachman’s Drive estate was built around one of the old north east approaches to Croxteth Hall. This approach remains in the form of the footpath which runs from Little Wood. Finch Wood is also now within the estate. As we have already seen, the lodges which were built at the beginning of the 20th Century still survive at the edges of the park. Croxteth Park remained a green and rural township right up to the time that Liverpool began to engulf it. Even today a huge percentage of it is made up of woodland and green space. The rest is taken up by modern housing estates, but many of the relics of previous centuries survives from Gillmoss to Deysbrook Lane. Living at the end of dam woods/rubbish tip.47 49 riviera drive,council, cobalt housing, refuse to accept any responsibility for this mess. Stating can’t define woods ownership. Maybe you could advise which direction next.thanks nf.Holme. I’m researching my GAUGHAN (John) and REYNOLDS (Ellen) and their families and found that they lived at 45 Albert Street which I found along the waterfront. He operated a slaughter house at that addressed (as well as living there or next door). His wife was a licensed hawker and sold provisions – as did 1 or 2 of their daughter. They later moved to Mosley Street. I’m attempting to learn more about the area where they lived and worked. Thank you for your help. They may have resided in Toxteth Park….